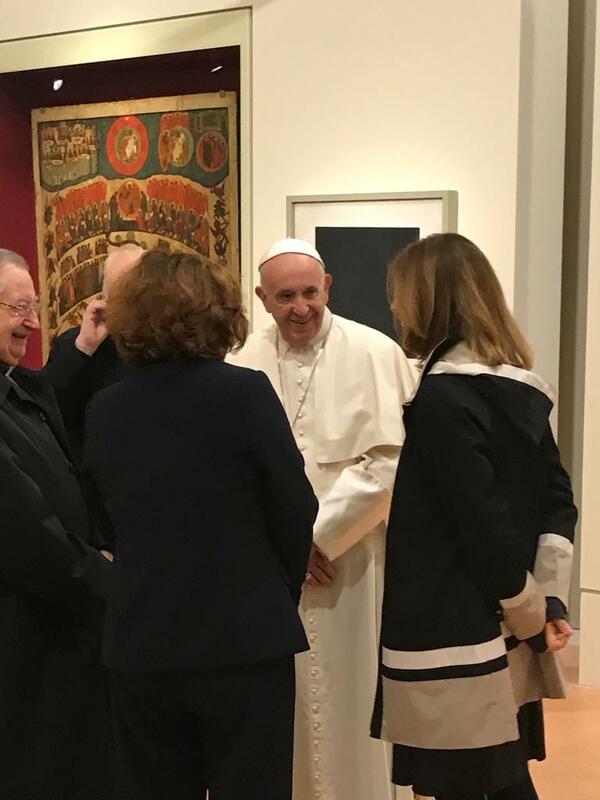 Pope Francis on November 27, 2018, visited the New Wing of Charlemagne to visit the Exhibition Pilgrimage of Russian Art. From Dionysius to Malevich. He was accompanied by Barbara Jatta, Director of the Vatican Museums; and Zelfira Tregulova, director of the Tretyakov Gallery. In Autumn 2016 the Tretyakov Gallery hosted an exhibition “Roma Aeterna. Masterpieces of the Vatican Pinacotheca – Bellini, Raphael, Caravaggio”. It was the first time so many as 42 outstanding masterpieces of XII-XVIII centuries had left the Vatican museums’ permanent collection. That exhibition was a remarkable event in the world of art, reports representatives of the Tretyakov Gallery. Now, the favor is being returned as the Tretyakov Gallery and Alisher Usmanov’s charity foundation “Art, Science and Sport’ opened an exhibition on November 19, 2018, in the Vatican Museums. The backbone of the exposition are pieces from the Tretyakov gallery, however, there is a number of works from other Russian museums. The exhibition is a response to the generosity of the Vatican Museums. The curators have set a goal to create an exhibition as remarkable in the selection of works and significant for the society as the one in Moscow was. It is a cultural message from Russia to the Western Christian world. According to the curator, the exhibition looks into the diversity of Russian perception of art and points out at the succession of spiritual traditions, an inner and deep connection between icon-painting and Russian realism of the 19th century. While preparing the exhibition an original and ground-breaking concept emerged and there was a selection of works of exceptional value and significance.